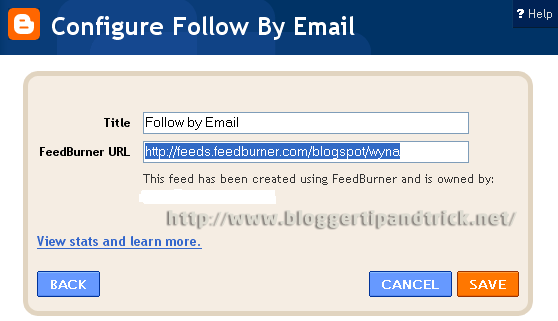 Now Blogger has introduced "Follow by Email" Feedburner email subscription widget for blogger blogs. So you don't want to add your site to the Feedburner manually. It will save your time. 1.Log in to your dashboard --> Design -->Page Elements. 4.Now if you want you can add "FeedBurner URL" manually. but your feed address is automatically added to the "Feedburner URL" box by Blogger. 5. Click save. You are done. Hello, I recently added this gadget to my blog. I was really excited about it because then people could join my site that couldn't before. The standard "join this site" follow that comes stock with the blog doesn't allow all Emails to be submitted. So anyway, when I found the follow by Email gadget I was pleased. The only problem with it I have is that it doesn't display those who have subscribed under the pages followers. Is there a way to fix this? Or do you know of anyway to fix the stock follow option so that it allows any Email.